We churn out thousands of barrels each month, regardless of whether it’s trading at $50 a barrel or $150 a barrel. Texas made its mark by being bathed in black gold while pumpjacks and derricks dotted the horizon. The Midwest became the center of fracking, as the oil industry cooked up new ways to pull crude from the earth. But the price of oil can swing wildly, and it’s a resource with a finite supply. Eventually, we’re going to start running short on the black stuff, making it incredibly expensive. That’s great if you’re selling oil, but bad if you’ve got to fill up the tank in your car, heat your house or buy anything made from petroleum-produced synthetics. Several years ago, I moved from Cincinnati to Madison, Wisconsin. It was the first time I caught sight of vast fields littered with massive white wind turbines. The flat plains offered great access to the winds whipping across the U.S.
At that time, solar panels were still few and far between; their price and installation costs restrictive. Former President Jimmy Carter announced that he is leasing 10 acres of his farmland to build a 1.3-megawatt solar power station to provide more than 50% of the electricity for the city of Plains. Lawmakers in California and Massachusetts have both introduced bills to require their respective states to get 100% of their electricity from renewable sources. The California Energy Commission reported that the state received 27% of its electricity from renewables in 2016 and has set a goal of hitting 50% by 2030. Massachusetts wants 100% of its electricity from renewables by 2035 and all its energy needs (including heating and transportation) from renewables by 2050. Hawaii enacted a standard in 2015 to get 100% of its electric from renewables by 2045. Nevada is pushing for 80% of its energy needs to be met by renewables by 2040. And outside the U.S., Saudi Arabia — the oil king of the world — has launched a $50 billion renewable energy plan. It plans to harness 10 gigawatts of renewable energy by 2023 through wind and solar plants. By the close of the initiative, the country aims to produce 700 gigawatts of renewable energy. 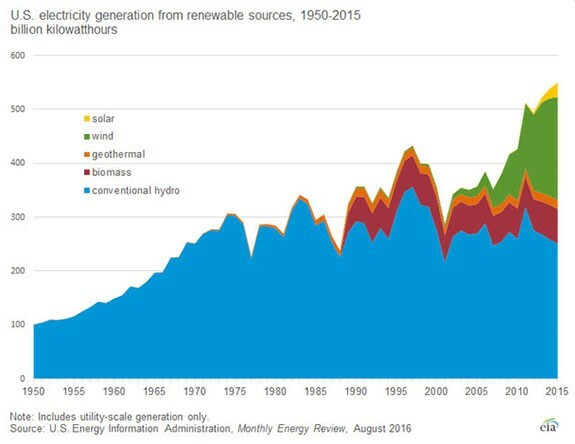 Renewable energy has experienced stellar growth. In 2016, solar companies added 51,000 jobs — 2% of all jobs created in 2016. The solar market nearly doubled in 2016. Production capacity grew by 95% to 14,626 megawatts, according to the U.S. Solar Market Insight Report. In fact, Maryland added 1,160 solar jobs as the state set the goal of 25% of its energy coming from renewable energy by 2020. Meanwhile, General Electric recently reported that its Renewable Energy onshore wind division signed contracts in 19 countries, including Japan, India, Greece, Saudi Arabia and Germany. GE’s onshore wind turbines installed base now stands at nearly 57,000 megawatts of global capacity. The U.S. Energy Information Administration reports that in 2015, renewable energy accounted for 13% of the energy generated in the U.S. Wind power provided roughly 5%, and solar power provided approximately 1% — though both are seeing significant growth. There is one renewable energy that is widely overlooked, but its supply is greater than crude oil, coal and natural gas reserves within the United States. What’s more, Paul Mampilly has identified a company that has developed a unique technology that makes it possible to tap more of this energy more cheaply than many of its competitors. To get his special report about this stellar opportunity, click here. Despite America’s ongoing love affair with oil, the effort to use more renewable energy is growing. More states are looking to get the majority — if not all — of their electricity from renewable sources. And at only 13%, there is still ample room for growth within the U.S. Oil will continue to be a great investment opportunity, but it may be time to add some exposure to renewable energy as the demand steadily skyrockets.